People love my lipstick. I kid you not - both men and women ask me what colors I wear and what brand they are. I've gotten asked about this in Subway the restaurant and on the subway itself. I figured for my first, and most likely only, beauty post I'd share the secrets of my lipstick success. It's really pretty simple - Nars is the answer to every and all lipstick dilemmas. Nars makes the best lipsticks around. 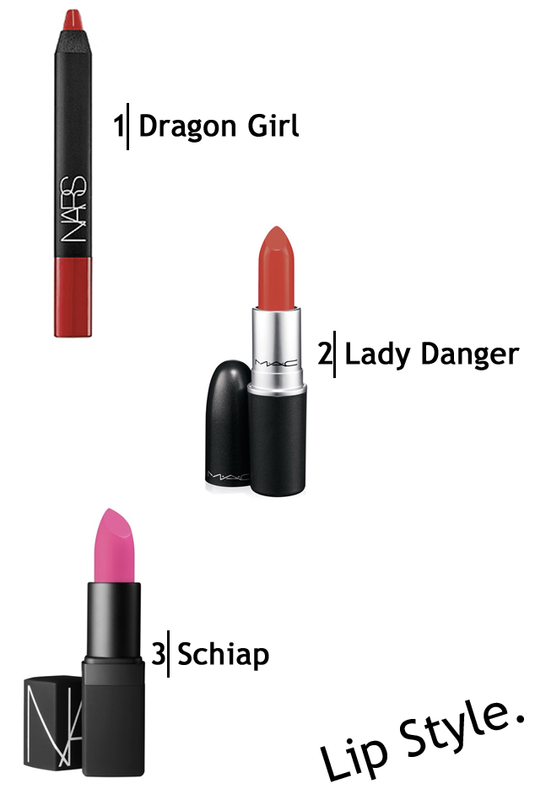 I do love Lady Danger by MAC as well, however, I found that I didn't like any of their other lip products. My three go to colors are bright red, bright orange and bright pink. With the colder months approaching, I'm leaning towards purchasing a dark burgundy color from Nars as well. I tried out some Nars samples at Sephora and really liked their Dark Empress lipstick. Well, the cat is out of the bag - my secret is revealed, all good lip colors are created by Nars. Gorgeous color choices! Thank you for sharing them! :) Have a nice day!